The 2015 harvest started off in mid-August (early) and was the last year of our five-year drought. As with our Estate Chardonnay, this wine is barrel-fermented in French oak and aged on the yeast lees for ten months in our Mount Eden cave. 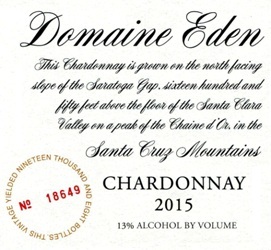 Two-thirds of the final blend came from our estate vineyards and one-third from the Chardonnay grown at Domaine Eden. In early spring we review which lots of the Estate fruit are destined for our flagship Estate Chardonnay and which will go into the Domaine Eden. We taste through each barrel: those that have the most verve, reticence, length, and acid structure are candidates for the Mount Eden Estate; and the ones which are more forward in their fruit and are perceived to be earlier maturing, go into the Domaine. It is a little humbling because, with bottle age, the Domaine wines compete well with the Estate Bottling. Lovely perfume of lemon, hazelnut, and vanilla, this Chardonnay gives way to a powerful palate with all-important minerality. The mountain terroir is especially evident in the lingering finish. This small-yield vintage is a good candidate for the cellar so expect a peak in 2022 and beyond.